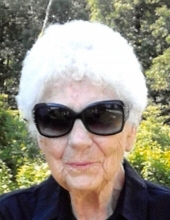 Edith Mae Cotton was born March 3, 1925 in Laurel County, Kentucky and departed this life November 16, 2018 being 93 years of age. She was the daughter of the late Frank and Dessie (Morgan) Hensley. Edith is survived by three daughters, Debbie Hughes, McKee, Ky., Cindy Beatty and her husband Duane of Crittenden, Kentucky and Roxane Cotton of Richmond, Kentucky also by eight grandchildren and nine great grandchildren and one great great granddaughter. Edith was preceded in death by the following siblings, George, Gene, Ben Hensley, Mary Ward, Glenn and Gladys. Edith attended the Trinity Church of God. Funeral services were held Monday November 19, 2018 at 1:00 P.M. at the Lakes Funeral Home with Bro. Larry Million officiating with burial in the Liberty Cemetery. Lakes Funeral Home in charge of the arrangements. "Email Address" would like to share the life celebration of Edith Mae Cotton. Click on the "link" to go to share a favorite memory or leave a condolence message for the family.